Like father like son … unfortunately, in this case. It was around this date that Ptolemy XV Philopator Philometor Caesar, “Caesarion” to his pals, the son of Julius Caesar and Cleopatra, was put to death by orders of the autocratic Octavian. 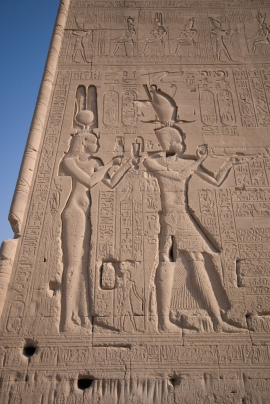 Cleopatra and Caesarion walk like Egyptians at the temple of Dendera, Egypt. Caesarion (“Little Caesar”) was the only known son of Julius Caesar. Octavian, whose claim to power proceeded from his status as Caesar’s adoptive son, became the Emperor Augustus after eliminating the dangerous rivalry of his “brother”. 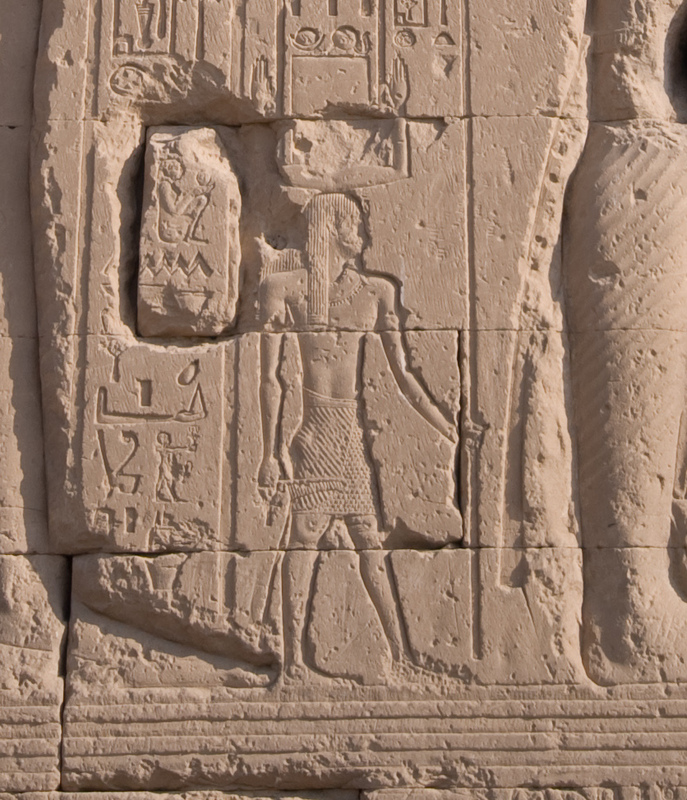 While most of us at the age of three were putting Matchbox cars in our mouths and eating macaroni and cheese, little Ptolemy XV was co-ruler of Egypt with his famous mom. King in name only, he must have seen his mother still grieving because of Caesar’s assassination March 15, 44 B.C. The little tyke, though born in Egypt, spent the first couple of years in Rome with Caesar and his mother. Then his dad was stabbed, repeatedly, and Cleopatra took the boy home to Egypt. Proclaimed “King of Kings,” little Caesarion couldn’t realize at his young age the power struggles roiling around him and his mother. There was some wrestling going on, and not Greco-Roman. No, there were men who wanted power. Lots of power. There was Mark Antony, Cleopatra’s lover and a Roman General. He was Julius Caesar’s second cousin. There was the patrician Marcus Lepidus, Caesar’s, for lack of a better word, deputy dictator. Then, the aforementioned Octavian (Julius Caesar was his great uncle). Together, the three were the Second Triumvirate, a dream team of Roman political heavyweights. Supreme rule they had. Ambition, sometimes, makes a mess of things. Only one of the three would stand victorious at the end, and there’d be casualties, like Caesarion. Lepidus was driven into exile to Circeii. At least he died peacefully years later, securely ensconced as the Triumvir You’re Most Likely To Forget. Antony escaped to Egypt, but as Octavian’s legions closed in the following year, Antony committed suicide by stabbing himself with a sword. He died in Cleopatra’s arms. 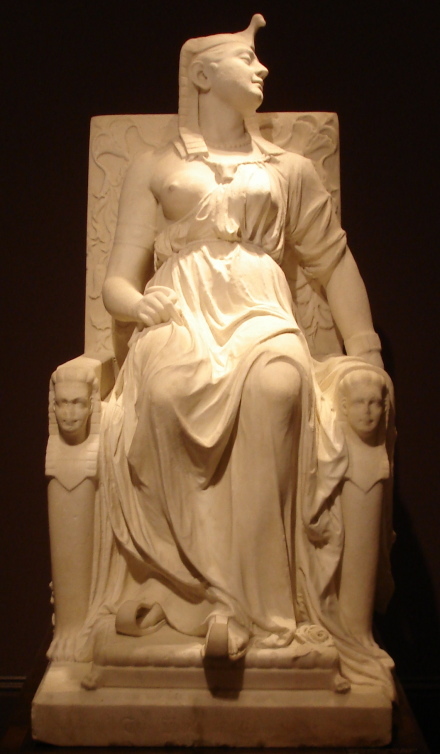 Cleopatra’s arms would be cold with death soon after when she committed her famous (supposed) suicide-by-asp on August 12, 30 B.C. Before the Queen died, she sent her son Caesarion away from the political tumult. Now 17, Caesarion bolted to the Red Sea port city of Berenice. Things were looking bleak for the young man. Octavian controlled Alexandria in early August, annexing Egypt to the Roman Empire. Antony died. His mother died. His father had been dead most of his young life. And now Octavian — making an offer he couldn’t refuse — was asking for the lad, the closest living blood relation to Caesar, to come to Alexandria. He was to be spared. There was nothing to fear. Mercy would be heaped upon Caesarion. It was not to be. “Two Caesars are too many,” Octavian declared … so Caesarion was subtracted. No documentation has been discovered about his death; because of his young age, it is thought he died of strangulation. Octavian assumed absolute power, became known as Augustus, and died of illness August 19, AD 14. While Augustus, during his reign, was proclaimed a god by the Senate, Caesar’s only known son became a footnote in history, long dead and buried. * More on the Battle of Actium here and here, and at this episode from the highly recommended The History of Rome podcast. -ed.